It's shaping up to be downbeat end to the week. 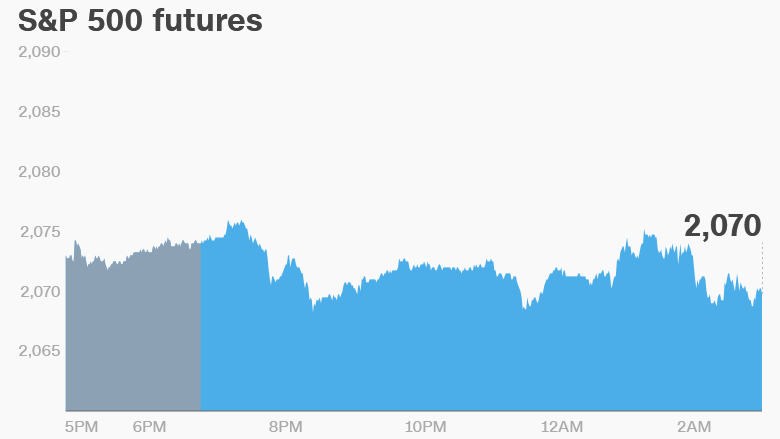 U.S. stock futures are edging lower, and European and Asian markets are all in red. 1. Stock market movers -- Amazon, Apple, Expedia: Amazon (AMZN) is surging 11% in premarket trading. The online retailer reported a fourth-straight profitable quarter and stronger than expected retail sales on Thursday. Apple (AAPL) is edging lower premarket. Carl Icahn, one of the company's biggest cheerleaders, said Thursday that he has sold his huge position in the stock, largely due to concerns about Apple's ability to navigate the treacherous Chinese market. International Airlines Group, which owns British Airways, is falling by more than 4% Friday. The group said recent terrorist attacks in Brussels hit sales. Expedia (EXPE) was up more than 10% in the extended trading hours on Thursday after posting a surprise profit in the first quarter. 2. Oil rally: Crude futures are edging up nearly 1%. Oil hit another 2016 high on Thursday, surpassing $46 per barrel, levels last seen since November 2015. Oil is up more than 70% since hitting a 13-year low in February. 3. Earnings and economics: Exxon (XOM), Phillips 66 (PSX), Chevron (CVX), AstraZeneca (AZN) are among the companies reporting quarterly earnings before the opening bell. At 8:30 am ET, the Bureau of Economic Analysis posts monthly personal income and spending figures. Canada's February GDP report is due at the same time. Several European countries reported solid GDP growth on Thursday. Spain's economy expanded by 0.8% in the first quarter, while France said its economy grew 0.5% in the first quarter. Eurozone GDP and inflation figures are due at 5 a.m. ET. 4. International markets overview: European markets are slipping lower in early trading, while Asian markets ended the session lower. The Japanese Yen hit an 18-month high against the dollar Friday, following a disappointing decision by the Bank of Japan to hold fire on more economic stimulus. 5. Thursday market recap: The Dow Jones industrial average was down 1.2%, while the S&P 500 slid 0.9% and the Nasdaq shed 1.2%.